An amazing group of women created a ministry at Christ UMC in Memphis named, "Threads of Love". They lovingly hand made over 2,000 scarves, enough for every elderly resident of Wesley Living communities. 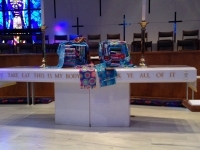 On the morning of January 12th at all 3 services, Christ UMC held a blessing of the scarves. The prayer was that our dear residents were sure to feel the love of Christ as they warmed themselves in this incredible generosity. Thank you and God bless the dear angels who created the scarves!